As global leaders of mobility product’s development and design, Sunrise Medical offers innovative technology to produce a vehicle that fits your active lifestyle. 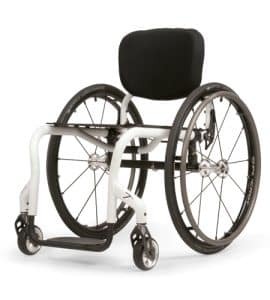 Manufactured with the smoothest ride in mind, the ultra light Quickie 7 Sunrise Medical manual wheelchair helps you break independence barriers. Its lightweight materials make it faster, thinner and lighter. This means it’s not only easy to transport, but it also gives you a stable and strong ride. With its freestyle backrest system, you won’t find greater freedom of movement. 7000 Series Aerospace aluminum brings increased strength, thinner frames, and light weight tubing, making it especially easy to transport at only 9.9 pounds of transport weight. Thanks to an open backrest system, the user experiences a greater freedom of movement, with a 360º upper body motion range. All of this prevents loss of stability and strength, presenting an 18% increase in strength-to weight ratio. The 7R and 7Rs Quickie 7 Sunrise Medical manual wheelchair is made to take its user wherever they want to go, and we offer you the option to custom build your own to fit your lifestyle. Its 3 caster settings, 2 frame lengths (per seat depth), 7 rear wheel options, and 9 tire options, allow you to choose whatever fits you. Contact our mobility specialists at Orthopedic Service Company to help you find your best fit or choose from a list of premium selections. We’ll help you in the search of your perfect ride. Contact Orthopedic Service Company today and speak with one of our mobility experts. By getting to know you and the type of life you live, they’ll be able to guide you through our wide range of mobility products to find you the perfect one. We’ll help you get the most value out of your purchase.